Next to the tomato, peppers are probably my favorite vegetable to grow and eat. Sweet Bell and Banana peppers are always a staple in our home garden. We also usually grow a few jalapeños and/or cayennes. This year I found a unique hot pepper in the seed catalog that I thought I would try. Fish peppers are a variegated leaf pepper with a cayenne like heat taste. They have an interesting history of how they came to be found in current seed catalogs. Fish peppers are a African-American heirloom dating back to before 1870. 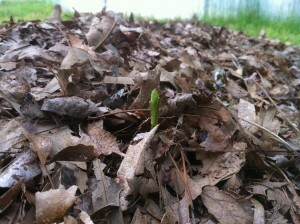 Here is a pic of our first attempt at growing garlic that we planted last fall. We’ve been wanting to get some garlic started for a while now and was excited to see it finally come up. The bed needs to be weeded some soon and then I will probably apply another layer of staw mulch. Here is our strawberry bed that we started a few years ago. Last years strawberries were looking promising until the deer found them and chomped them down. We were still able to harvest some but probably nowhere near as what we would have had. Above you can see the mesh net over the bed in an attempt to keep the deer out of the bed. So I ordered some Jerusalem Artichokes from Oikos Tree Cropsto plant for this spring. Jerusalem Artichokes (Sunchokes),Helianthus tuberosusare a native perennial in the Asteraceae (sunflower, asters) family. They are suppose to be a good alternative to potatoes being less starchy. From what I have read about them they are not very fussy and easy to grow. I ordered 14 Red Rover and 7 White Fuseau tubers. This is our first attempt at growing Jerusalem Artichokes and I’m considering another first………growing them in ahugelkultur bed. Hugelkultur is a raised bed filled with rotten wood debris. I don’t want to go into to much of an explanation of the hows and whys of a hugelkultur bed (check out the hugelkultur link above), but basically you pill lots of logs and wood, cover with organic material (leaves, compost, etc), cover that with some soil, maybe a layer of mulch, then plant. Hugelkultur beds could possibly eliminate irrigation due to the moisture holding properties of the wood. For more details check out hugelkultur and the videos below. I will post again soon about the hugelkultur bed building and jerusalem artichoke planting process once it is completed. The first sprouts of the jerusalem artichokes are beginning to poke out of the leaf mulch of the hugelkultur bed that my 4 year old son and I built and planted last weekend. 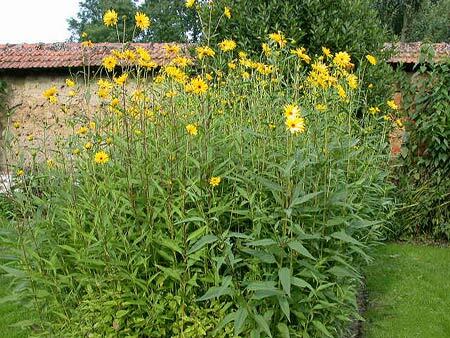 For some information on hugelkultur beds check out my previous post on jerusalem artichokes. There are two different techniques in building a hugelkultur bed. You can place all the large logs at ground level and then cover them with soil, or you can place the logs in a pit. The second technique provides you with soil to cover the bed. This is the method we chose. We didn’t have any extra soil around so it seem to be the more sustainable method since we didn’t have to purchase soil from offsite. First we dug a trench about 1 foot deep and 10′ x 4′. We then filled the trench with a bunch of rotting logs from a maple tree limb that had fallen 3 or 4 years ago. The next layer to go on was larger limbs. Most of these were either from fallen storm limbs or tree prunings. We then added another layer of small limbs that were found randomly throughout the yard and on the edge of the woods and then added a large pile of mostly oak and maple leaves that we had saved from last fall. About a month ago we finally got around to setting up our new greenhouse. Actually it isn’t really new. I received it as a gift about 3 or so years ago. In the process of setting it up, we had a malfunction that delayed the setup process, then eventually I just decided to scrap the whole project. But this spring I decided that I would try to set it up anyway and make some on the fly adjustments to the malfunction. 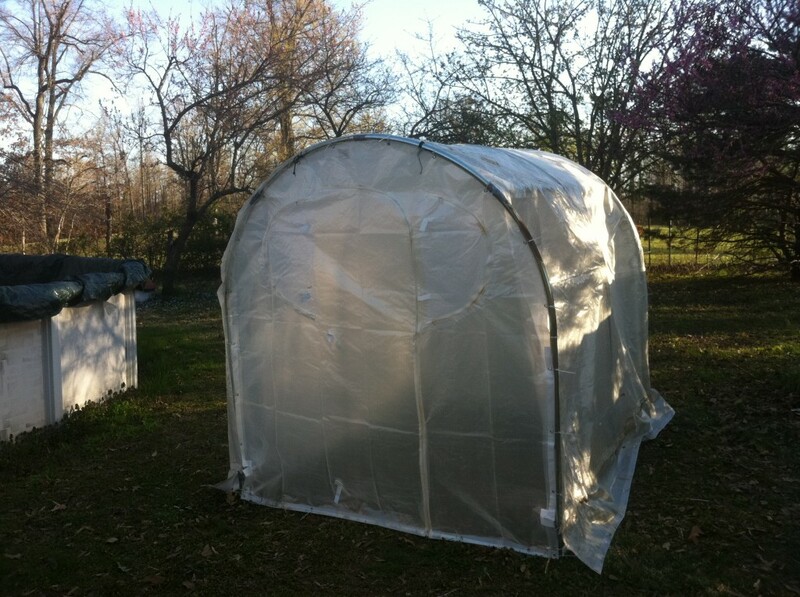 Anyway, after 3 or 4 hours of setup, our mini greenhouse was finally up. So far it has served us well and has withstood a number of spring storms with high winds. I’ve been starting my own tomatoes and peppers from seed for several years now. But a couple of years ago we started experimenting with starting more perennial and annuals (herbs, vegetables, flowers) from seed. We’ve developed a pretty good system with a few wire racks and fluorescent hanging lights in our basement rec. room, but we lose our rec. room for 4 or 5 months a year. 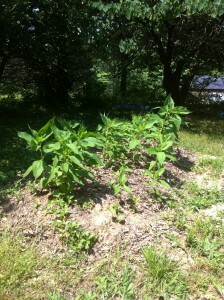 Above is an updated photo showing the jerusalem artichokes and hugelkultur bed as of May 31st 2011. I’ve added 2 pepper plants, 2 garden huckleberries, and a few other herbs her and there to try to fill in the sides. I’ve also tried to leave the dutch white clover that is coming up to act as a living mulch. 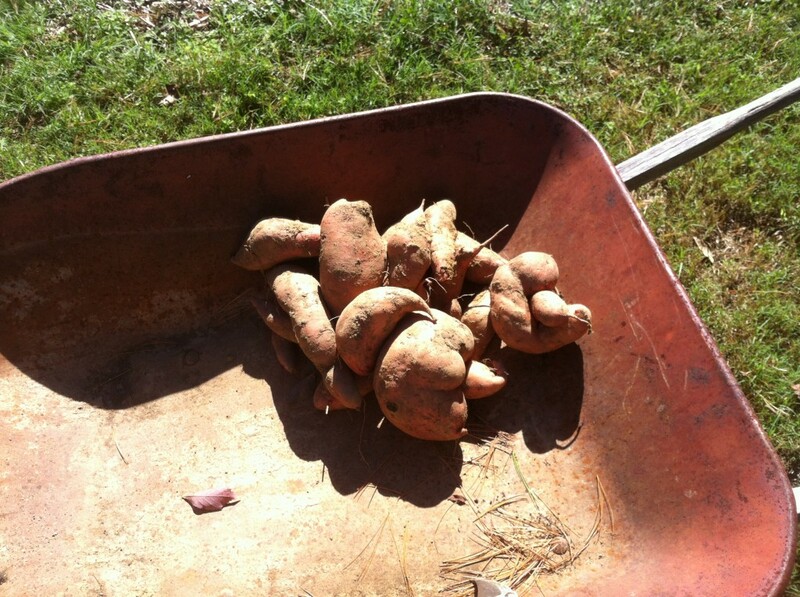 One should harvest sweet potatoes after the first frost has killed the plants or when day time temperatures have dropped into the 50s F. Dig the tubers with a pitch fork and if any get bruised, use those first because they will not store as well. Cure tubers by laying them out in the sun for a day followed by a warm (80 F) humid location out of direct sun for a couple of weeks. Finally store them in a dry, cool spot. They should store up to 5 -6 months. If anyone has any experiences they would like to share concerning their sweet potato harvest, sweet potatoes in a polyculture, or anything related please leave a comment. We planted this polyculture in a 10′x3′ ground raised bed. The sweet potato transplants and bush bean seeds were planted in a somewhat hexagonal spacing technique similar to what is describe in the Biointensive gardening method. Our garden beds are no-till. A top layer of compost was added to the bed a week before planting. Both sweet potato and bush bean seeds were planted at the same on May 8th. We started harvesting beans in early summer through fall, though as the sweet potato vines began to take over towards the end of the summer chocking out some of the bush beans. In late spring a layer of grassing clipping were added to the bed for mulch which lasted most of the growing season. 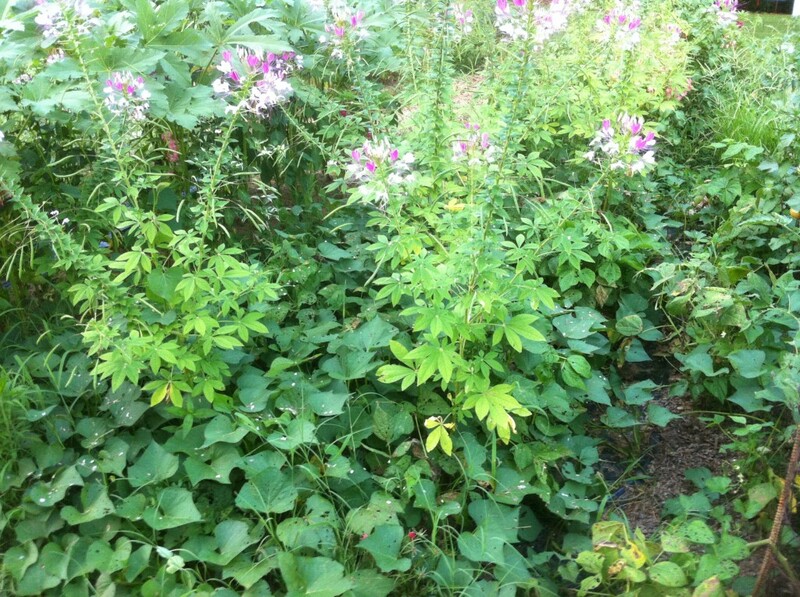 All of the flowering plants in the polyculture came up as volunteers. We experimented with a few different polyculture combinations this season. Some seemed to produce and work well, others not so much (more on polycultures and our experience with them in a later post). 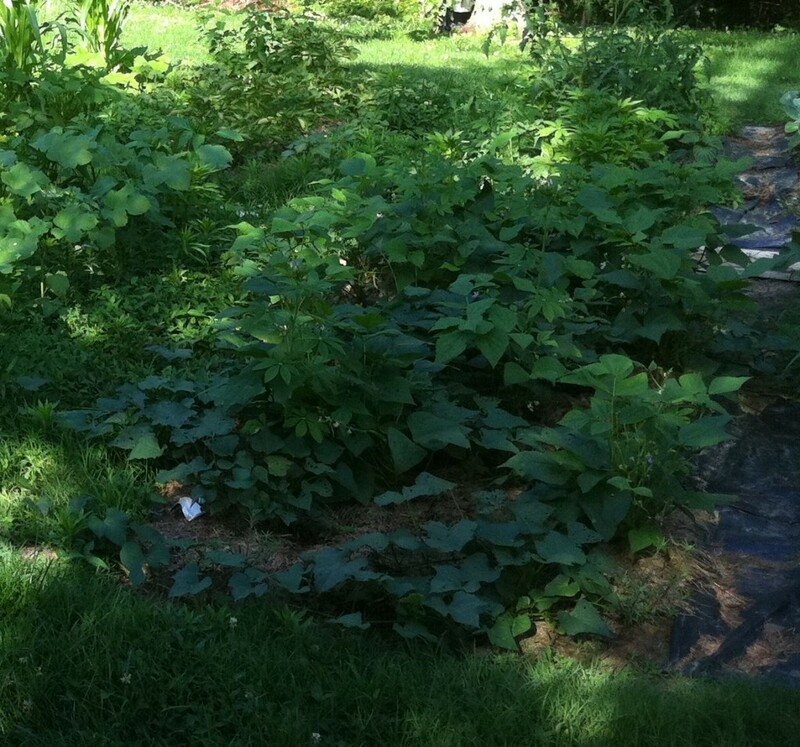 One polyculture that did seem to be promising was the sweet potato/bush bean/beneficial weeds polyculture. This year’s sweet potato harvest resulted in yields that seemed to be comparable to a single bed or rows of sweet potatoes. A polyculture can be thought of as the opposite of a monoculture crop. A monoculture is a planting of one single species like in a large field of corn or garden beds of single species. Polyculture combines different plant species together in the same space, similar to what one would find in a natural ecosystem. The idea is that a more bio-diverse system will decrease the chance of widespread loss to disease, provides more habitat for beneficial insects, and provide mutual benefits between each plant species. Inter-cropping and companion planting are a less complex form of polyculture, but the ideal polyculture will have many different layers of complexity with a high species diversity. I recommendGaia’s Garden by Toby Hemenway for a detail understanding of polyculture and its benefits. 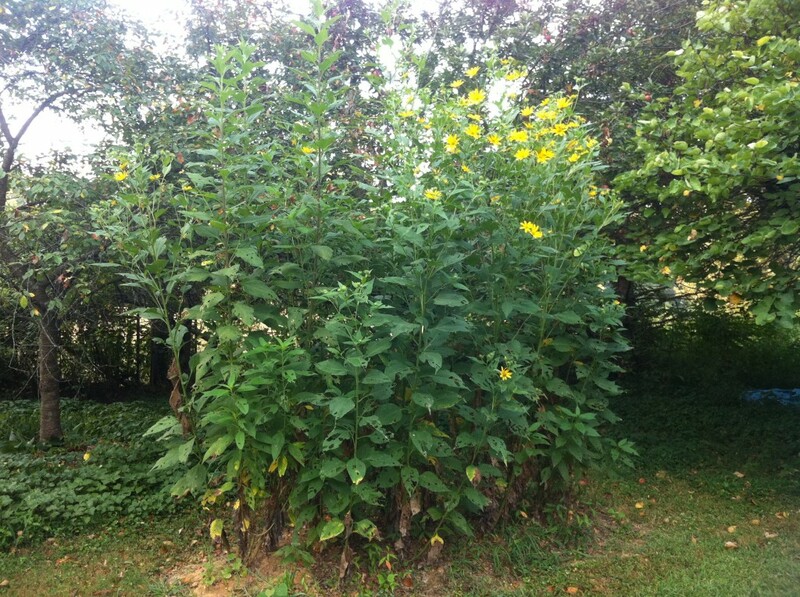 The jerusalem artichokes in the hugelkultur bed started blooming in late fall. The photo below was taken on September 3rd. By the end of September all the sunchokes were in full bloom and getting really top heavy from all the flower heads. It didn’t take much wind to cause the tallest plants to topple over to the ground. I guess the final results will be the harvest of the jerusalem artichokes and how well they produce. I plan on harvesting some soon and hopefully continue the harvest throughout the winter months. But as far as growing them is concerned, they were pretty much care free. I did a little weeding here and there, provided no supplemental irrigation all year, and well….that’s it. Though there was no sign of disease, I did have an infestation of some type of bag worm and there also seemed to be a high concentration of ants living on the plants. They were able to weather the storm from the bag worms and didn’t show any signs of stress. Next year I will be sure to mulch more heavily and I will also add some type of support to keep them from toppling over when in full bloom. I will also try to make the hugelkultur bed more of a polyculture by planting some other species of plants with the sunchokes. My next post concerning jerusalem artichokes will be on my first attempts at harvesting and the ways that we find to use them. In the mean time, check out Paul Wheaton’s latest video on sunchokes. Fall provides a great opportunity for us to collect a mulch source that is free and is an important element in building our soil. 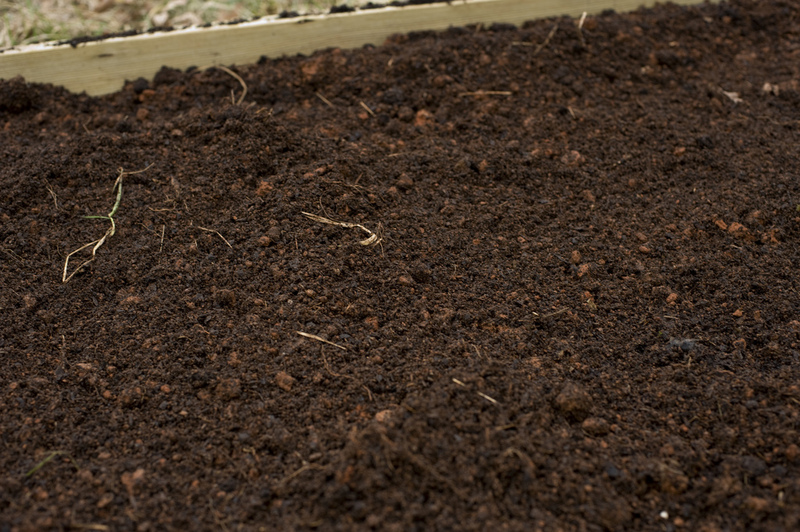 If at all possible, the soil in a garden should never be left exposed or bare for an extended period of time. Whether you use cover crops, straw mulch, leaf mulch, shredded newspaper, or landscape fabric (not my first choice); mulching is vital to protecting garden soil. Our strategy to provide soil protection for late fall and winter is to collect the massive amount of fallen leaves, mulch them, and apply them directly to the garden beds.